Lately on this blog we’ve been talking at length about The Marriage of Figaro, but today we want to tell you about an exciting new project we are undertaking as a result of receiving a Wallace Foundation Excellence Award. The four-year grant focuses on building relationships with the community through technology, and many of our new initiatives revolve around this summer’s Ring cycle. Do you remember what it was like attending your first Ring? 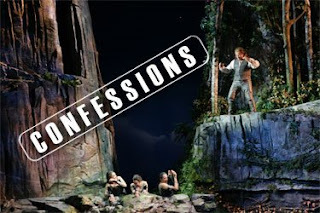 We want to capture that moment in a reality-style video series titled Confessions of a First-time Operagoer, in which we’ll be chronicling a young adult’s adventures attending the Ring. The host, selected via YOU, our blog readers (more on that below), will explore Seattle Opera from the inside out, taking a behind-the-scenes peek into the creation of the Ring, meeting some of the Ring artists, and receiving advice from Ring veterans, all of which culminates in attending their very first Ring cycle. What is it like to see Fafner the dragon come to life, from the technical crew hand-making each one of his scales, all the way to his fire-breathing glory on stage? What about seeing the Rhinedaughters “swim”? How do they go from their first aerial rehearsals to so gracefully navigating the Rhine river and losing their precious gold to the Nibelung dwarf Alberich? Or, imagine hearing the orchestra rehearsing the electrifying “Ride of the Valkyries,” a piece of music that permeates our culture from Bugs Bunny outwitting Elmer Fudd to the graphic novel and film adaptation of Watchmen. How does a young opera novice respond to Wagner’s monumental, Mount-Everest-of-all-operas, epic cycle? We’re going to find out, and we’re going to document every minute along the way! We are now calling all Ring rookies to apply to be our host! And if you’re reading this and you’re not a Ring rookie, that’s ok; we have several other projects that we are working on that are specifically designed to enhance the depth and breadth of your Ring experience (more on those initiatives in the coming weeks!). In the meantime, if you know someone who might be the perfect Confessions host, please direct them to this blog post or to our webpage and encourage them to apply. The application process is simple, and the ultimate selection of our host will come down to a vote right here on the blog! Interested candidates need to complete the short application as well as submit a 1-2 minute video explaining why they should be selected as our Confessions star. Videos can be snail mailed to us (see more details on our FAQ page), or uploaded to our Facebook page. Finally, we will be hosting a live casting call at the May 15th performance of The Marriage of Figaro! Any interested candidates may stop by our Confessions booth in the main lobby starting at 5:00 p.m., and we’ll film the video on the spot. The deadline to apply is none other than Wagner’s birthday, May 22, and starting June 1, we’ll have our finalists’ videos uploaded to the blog for a week of voting on who you want to see as the Confessions host. Are you the perfect host?